I've been obsessed with repurposing clothing! I've been sewing up dresses for my daughters out of my hubbs' old dress shirts (the ones with worn collars and thread-bare elbows!). There are endless possibilities and I'm well on my way to making them all, lol! My goal is to keep the cost of each dress at ZERO, and I've been successful so far! "The ideal equestrian has the courage of a lion, the patience of a saint, and the hands of a woman." I love the lint idea. I have been collecting it in an empty tissue box above my dryer. Now I have a use for it. Thank you for the wonderful idea. The dress is adorable..what a great idea! And, the model aught to be in pictures..besides this one! That is the sweetest little gal.....!!! I like your idea of making use of the shirts too! Thanks ladies! I've been looking at everything in a different way all of a sudden, and bringing home the most random styles of clothes from yard sales and such because I'm seeing it as just fabric now. Even clearance clothes at walmart in XXXXL sizes can be made into adorable stuff for me or my kids! Nancy, I like the idea of using a tissue box right by my dryer for lint! I recently took an old tin can from a soup can and made a pencil holder out of it. Okay really its to hold markers and paint brushes. I ran out of room in my other pencil/ pen holder for the markers and they were getting lost. Trying to eliminate the "stuff" in storage and eliminate the extra cost per month, so it's time to be firm. Two old saddles- what to do? They were my husband's favorites and held many memories- can't throw them away. I took them to a man who worked on restoring leather and he soaked them and then oiled them for three weeks. They look great, but can never be used because the leather is too old and brittle. He told me how to keep them looking nice (rub down with olive oil), and I have them both on wooden sawhorses in the living room (I moved the couch to the game-room and have three chairs now). Et Voila- when the two year old grand-daughter comes over, she has two "horses" to choose from. They go with the decor (hunting/western theme). My husband sees them every day and it makes him happy, too. Well, two items down, a few more miscellaneous to "repurpose" . . .
You're never too old to start over. Molly, precious!! Love the dress and your daughter is adorable. Joanne, love the can you did, going to use that idea and I am going to try to take a large juice can and make a knitting needle holder for my sewing room. Keep the ideas coming! So many neat things to do here. I love the ideas Iam getting from reading all your creative ladies! The pictures are fun to see too. Keep the ideas coming. We just made a potato tower out of out of old pallets. I tried using a barrel last year but felt like they didn't get enough sun while they were low in the barrel. We will add pallet boards as they grow and we fill the tower. When I need new potatoes I can remove a lower board and harvest enough for dinner leaving the rest to grow! Wish me a bountiful harvest please! My favorite repurpose is an old tin stacked lunch bucket. It has 5 layers and a handle that swings up to hold it all together. I use it to hold the different colored wool strips I use for a hooked rug. It is portable and closes securely. I love the way it looks sitting next to my hooking chair. Thanks for the inspiration in all your posts! Connie - I love the potato tower out of pallets idea - think I am going to try that this year! I was the lucky recipient of Beverly's tree and I love it. I'm leaving it out all year. It sits on one of my ledges. Thanks again Beverly! 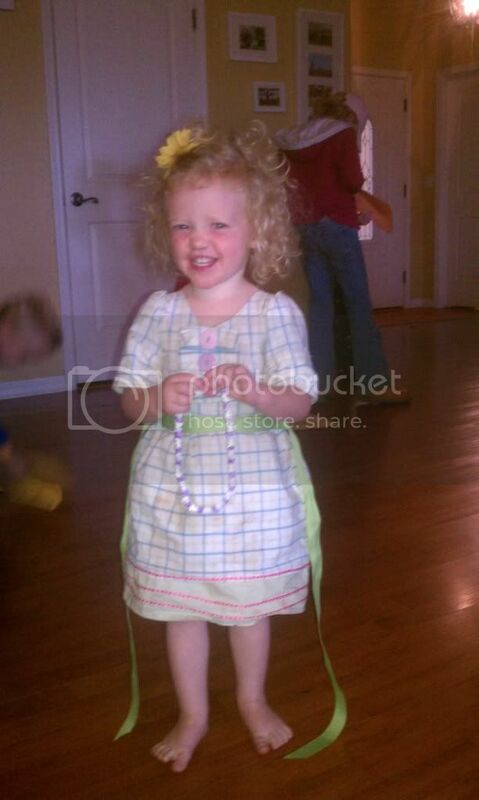 Molly, your daughter is so cute and the dress adorable! What a great idea. I have a great idea for your garden, at the end of voting season in your area. Gather by permission the political signs that stick in the ground. Remove the signage and keep the metal portion. You have the perfect row covers for your garden, plunk them over a row, cover with plastic and secure! It's the only thing I look forward to about voting season! Since it is seed-starting season here in the north, I reuse the plastic containers that hold grapes and organic lettuce mixes as mini-greenhouses. After putting my peat pot with starter mix and seeds in it, I water them down, tuck the lid over, and put it in my indoor greenhouse set up with lights. The new seeds stay moist, and under the lights the container gets toasty warm. I find my seeds germinate much sooner, and stay healthy, too! I've done similar things with plastic bottles with the bottoms chopped off (slide over peat pots) and large glass jars. Cardboard egg cartons work well for mass seed-starting--fill with seed starting mix, sprinkle on your tiny seeds, water lightly, and tuck into a plastic bag. Loosely close the end of the bag, and park in a warm spot. Once the seeds germinate and seedlings develop a couple of leaves, be sure to take the plastic bag off so that too much moisture doesn't create mold or rot issues. My DH and o are redoing our entire yard. Not normally something we'd try to take on in one season, but it had been neglected for about 5 years or more, and this is our first complete spring here, and my DH is off work for a short Tim(normally its 7days/week). Somewhere along the life of this yard, people have had palm trees, rock beds, ARTIFICIAL FLOWERS, AND GARBAGE BURIAL in this poor yard. Some places are not gardenable, I don't know what all was in their garbage(a few shoes, plastic containers, broken glass, ugh how gross!) Anyways, I wanted to put a bench and urn in one "garbage burial site", and so we turned it over, cleaned it out with gloves of course, and dug up the buried rocks from lost and scattered rock gardens of old, and laid plastic down, made a small sitting area, and put all the rocks there. Around the whole parameter of the yard, is what was supposed to be a flower bed.300+ linear feet of flower bed, ALL ROCKED UP, WITH RANDOM HOUSEHOLD GARBAGE BURIED UNDERNEATH!!! Again, we cleaned it up, and I wanted something organic with good texture. I was pricing tanbark. It is too much money. O thought and thought, "what can I cover this mess with?!?". Across the street, the family hired a tree company to remove three trees. The company brought with them a wood chipper. My DH talked to them, and offered to buy the raw chips from them. THEY SAID NO, YOU CAN JUST HAVE IT!! Most of the chips are pine. They even smell wonderful!!! The parameter of the yard is now covered with un-aged, beautifully textured wood chips. It is so pretty. In a few years, it will be true tanbark, but I get to enjoy it now too. All for free. So thrilled with results. When complete, I'll try to post before and after pics! The tears I shed then, watered the flowers I harvest now. I'm saving goat feed bags and horse feed bags, to make both girls tote bags (like the dog food bag tote bags I made on my S.C.R.A.P. blog). They both want one. I just have to get the time to sew them up. I love this topic! I am a deeply devoted repurposer, and really try to think about how the item I am buying new can be used after it serves its first purpose. It is a challenge I like to take on! I have also used the black paper from the older albums in mail art which is fun. I also recently used bottle caps to make necklaces. The bottle caps from beer or sodas look great after a touch of spray paint. Then I made a hole with a nail, glued a picture of someone inside, glued a little glitter in there, attached a pretty ribbon, and have them ready to give for Christmas. It was a fun project. Thanks for all of the good ideas! For row markers last year we used plastic knives. We wrote on both ends so if the sun bleached off the works on the top end we would still know what it was by looking at the bottom end. This thread is awesome! I love hearing new ways to use things! I have been collecting used 5 gallon buckets from the grocery store bakery. They get their frosting in them, and if you ask they hand them out for free! (I have had to pay $1-$5 dollars depending on the store, but it is still cheaper than getting them new!) I drill holes in the bottom and use them as planters, or attach a Gamma lid and keep my bulk dry goods in them (flour, beans, rice.) All my empty milk jugs get used either as emergency water jugs in the freezer, or the tops get chopped off and they are used as planters or seedling covers. And my egg cartons are saved as seed starter trays! The re-purposing does not end around here, LOL!